Sunday May 2nd 1897 We got the work done up early to go to church. Went over home for dinner. They have been hard at work cleaning house the last week. We came home before it was late to do our chores. Mr Spencer was buried today. Monday May 3rd 1897 I picked the [ducks?] this morning and churned. Will went up to Ida's for eggs to set. In the afternoon I set hens and raked in the yard. Ed & Ada called a little while. Tuesday May 4th 1897 I finished raking the yard in the morning and burned the stuff as the wind did not blow. Will cleaned out the hen house for me and white washed it. In the afternoon he helped me wash. a pleasant day. Wednesday May 5th 1897 I ironed and baked bread this morning. Will had dinner at eleven oclock and went to town in the waggon. Father & Mother came just as dinner was ready. They stayed all night. Aunt Linda and Em Weldie were here in the afternoon. weather warm as summer. I did a lot of mending. Thursday May 6th 1897 I was busy with the work most of the forenoon. I had churning to do. Mother was over at Aunty's a little while. It was very warm. The folks started home about four oclock. 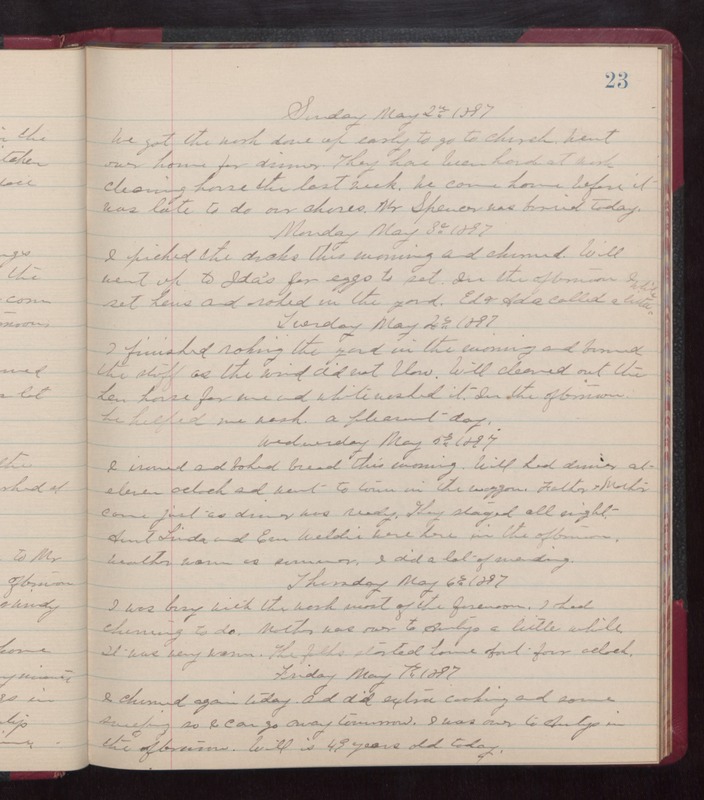 Friday May 7th 1897 I churned again today and did extra cooking and some sweeping so I can go away tomorrow. I was over to Auntys in the afternoon. Will is 49 years old today.